Understanding the way the body responds during energy medicine facilitation provides the fundamentals of how healing occurs. This chart illustrates a full perspective of the body’s reactions to energy medicine. Using energetic vocabulary, this chart explains the body’s physiological response during an energy medicine treatment. 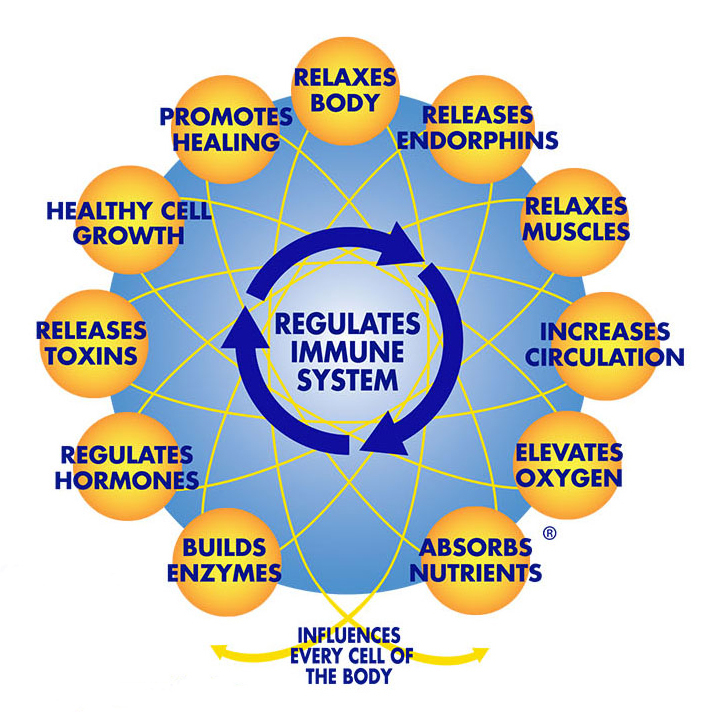 Following the chart in a clockwise direction, beginning with “Relaxes Body” and ending with “Regulates Immune System”, this chart demonstrates the body’s reactions during an energy healing session/treatment. Energy medicine treatment initiates relaxation to the body. The relaxation response releases endorphins in the brain. The endorphins relax the muscles. Relaxed muscles create more space between cells providing increased circulation. The increased blood flow elevates oxygen levels throughout the body. Accelerated blood flow allows nutrients to be absorbed more efficiently. Hormones regulate to strengthen the body’s constitution. When the body has a stable physiology, the immune system is regulated. The resulting stability within the immune system affects the physical, emotional, mental and spiritual facets of the body’s energy field supporting self-healing. “Every animal who comes into my hospital receives HTA along with traditional allopathic and holistic veterinary care. Pain and anxiety are drastically reduced by the use of HTA and the precise techniques give tools for specific problems enhancing the care and healing of my patients.